Do you want to drown yourself in travel luxury inspiration? The Louis Vuitton Volez Voguez Voyagez exhibit at the American Stock Exchange building will make you yearn to take a posh cruise with 200 of your favorite frocks in trunks. 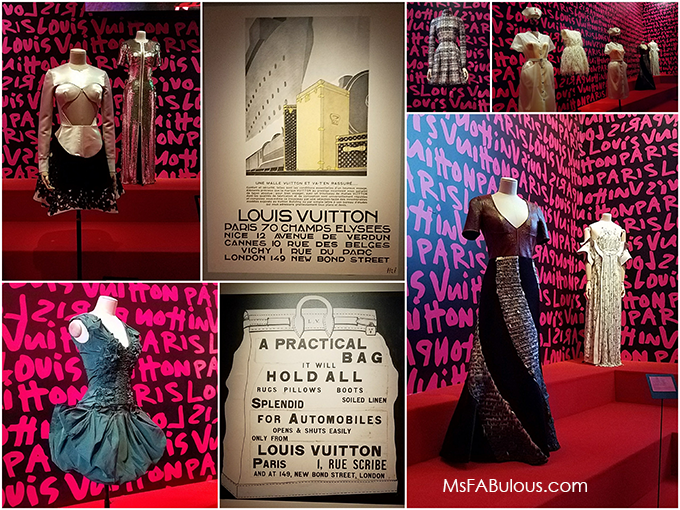 This was an extensive show, detailing the humble beginnings of Louis Vuitton, who at 14, traveled to Paris to work as a box maker. He perfected his craft to make a light, ergonomic travel trunk that quickly became the favorite accessory of the elite. Signature Louis Vuitton details established then that continue today are his use of canvas (which is waterproof) and monogram patterns that were a protection against counterfeits. How could you not drool over the classic trunks of wood, metal bolts, handpainted monograms full of drawers for your precious things? There were many examples of vintage ads touting the practicality of Vuitton's products, not the luxury of them. Other bags were introduced to adapt to the way his customers traveled. The canvas steamer bag was an innovation because it could be folded into the trunk but also brought out less formally, like the first overnight bag. 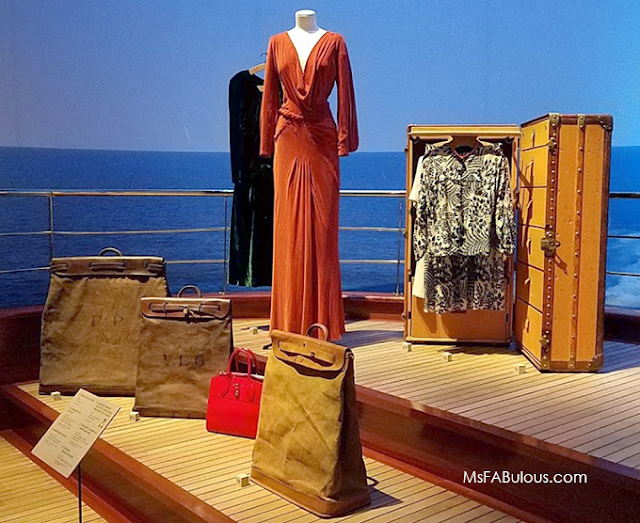 Other bags included cases designed for the new craze of automobiles, more portable carryalls for plane travel, etc. The house of Louis Vuitton had always collaborated with artists. The painting trunk designed with drawers to support framed works, documents, art supplies had me pushing my face up to the glass with envy. I don't know that many artists that can afford such a treasure, but we can dream. There were writers trunks, cases for your important LP records, tea sets, if your lifestyle demanded it, it was designed. Modern collections of Louis Vuitton continued the collaboration with artists. Remember the Takashi Murakami craze of 15 years ago? How about the graffiti splashed Stephen Sprouse collection? There are collaborations with other designers like Rei Kawakubo or even the recent project with streetwear brand Supreme. There was a glamorous display of the fashion the brand has put out. While I loved the clothes, they always seemed very removed from the classic travel luggage brand they had established. This certainly didn't stop the many celebrities who have worn them over the years on red carpets. 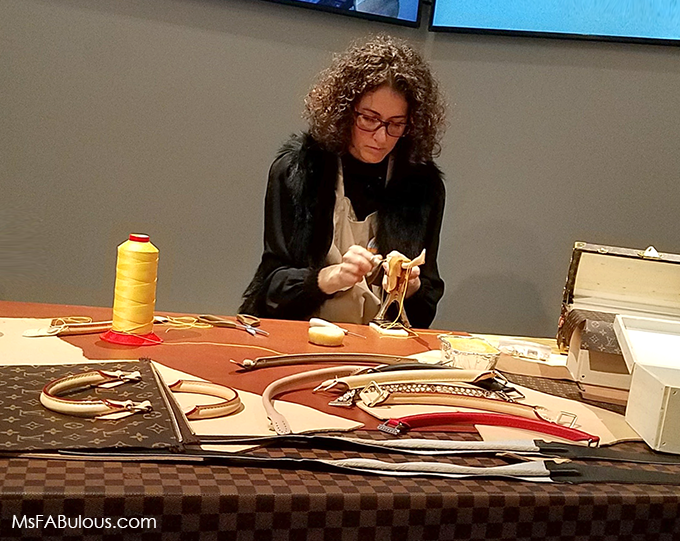 Just in case you forgot that Louis Vuitton products are a handcrafted creation, current artisans were on hand to demonstrate their craft in person. I loved the theatricality of some of the rooms. Mixed media helped give you a sense of motion in traveling an antique train to the tiled subway video walls at the beginning. One comes out of the Louis Vuitton Volez Voguez Voyagez exhibit ready to mortgage your house on a bag. Luckily for my finances, they don't offer the bags for sale at the end. Instead, you leave with a Louis Vuitton pin to wear as your souvenir. Louis Vuitton, Volez Voguez Voyagez is at the American Stock Exchange Building in NYC until January 18, 2018. Book your (FREE) tickets.